Available in a variety of different colors, the PMS Ink Printed design option creates colorful unique custom napkins. 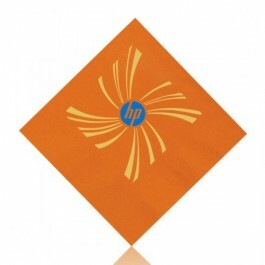 These napkins add a sense of style to any personal or corporate event. Each personalized beverage napkin is completely biodegradable, and crafted in the U.S.A. Printing your family monogram or initials on these personalized wedding napkins creates a classy party favor for any occasion.